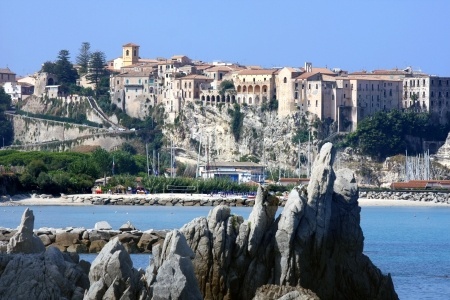 Hello and welcome to our site about Calabria, Italy. My name is Corinna and I’ve been in love with the region ever since my family’s first visit. Take Tropea, this little beautiful town that is lying on a rock at the seaside. On a beautiful day you can see the Stromboli vulcano from there. There are lovely small stores where you can find Calabrian specialities like arts, pottery, clothes and so on. They also make funny prints on T-shirts. In the evening the town is shining beautifully and there’s live music on the streets, so wonderful. The people who live there, open the windows and enjoy this in the same way as the tourists. And when the music is finished, the tourists hand the musicians some money and the locals simply throw it from the windows. An exciting experience, friendly, typically Italian. We also love the clean and clear water. There are some beaches with fine, white sand, which are not overcrowded. The hotel "Rocco Nettuno" is great and also lying on a rock over the sea. The employees are friendly and the food is very good. You can choose between the pizzeria or the restaurant "Le Terrazze" there you can choose between pasta, meat, fish or sweet foods. The rooms are also excellent. We had one with a sea view. An elevator or stairs lead you to the beach. My son loves the big pool, the food, the other children and naturally the pizzeria. He had much fun there. Pizzo is also a nice, little town nearby. They say the tartuffo ice originates from there. Very beautiful is the old downtown with its historical buildings. The region’s main city is Reggio di Calabria, located on the Stretto di Messina, the strait between the mainland and Sicily. Another place worth visiting. We built this website to show you how much we love this part of Italy. I hope our advice and tips are welcome. If you haven’t been there, you should go there as soon as you can!